Audi may bring the A1 entry-premium car to the U.S. in six to eight years. HERNDON, Va. -- Audi of America President Johan de Nysschen says the United States and its small-equals-cheap mentality isnt ready for premium subcompacts such as the Audi A1, which goes on sale in Europe in 2010. In an interview here with Automotive News Monday, de Nysschen said Audi is seriously looking at bringing the A1 to the United States in the cars next generation six to eight years from now. Bringing it here earlier could damage Audis efforts to build widespread recognition for the brand, he said. De Nysschen said Audis U.S. dealers asked for the A1, until they found out what it would cost. European pricing hasnt been set, but the car likely will have a price tag of about 20,000 euros or $25,541 at current exchange rates. 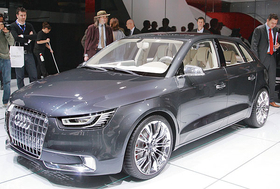 The A1 is about 10 inches shorter than the A3, Audis smallest U.S. model. In Europe, the A1 will compete against BMWs 1 series and Mini models. Both are sold in the United States.